Six Degrees | Can Campaign Design Win An Election? 14 Mar Can Campaign Design Win An Election? If you look at presidential campaign designs across the last 20 years, you will find a monotonous mess of serif fonts and abstracted American flags. However, some 2020 presidential candidates are bucking this trend through their campaign visual identity and design…specifically, the women. Parting ways with the traditional red, white, and blue, female presidential candidates for 2020 are using color and design to signal to the American public that something new is coming and to distance themselves from the status quo (and history). Many are following the example set by Alexandra Ocasio Cortez’s unprecedented campaign design featuring warm earth tones, with no American flag imagery in sight. Kamala Harris’s campaign features a butter yellow and deep purple (a tribute to the campaign colors of Shirley Chisholm, the first black woman elected to Congress and a candidate in the 1972 presidential election). Elizabeth Warren’s campaign straddles the old and new by using navy blue and red with turquoise and a sans-serif minimal logo. Kirsten Gillibrand uses navy, white, and pink. Tulsi Gabbard uses warm orange and lettering with a navy gradient to create a sunset effect. Other candidates are keeping at least one foot firmly planted in campaign tradition. Cory Booker uses black with the expected red, white, and blue to give his design a slightly modern twist. John Hickenlooper uses purple, white, and blue with flag stripes and stars to create mountains under a starry sky. Jay Inslee uses red and white with a blue-green gradient earth and traditional serif lettering. This split in political design represents the political polarization of today as both parties, and all candidates, attempt to carve out a unique and compelling identity amidst a messy political environment with lots of candidates, instant 24/7 judgment in the public opinion court of social and traditional media as well as ephemeral loyalties from a more cynical and highly divided electorate. Political campaigns 20 years ago looked quite similar across all parties, with most candidates identifying with a common middle ground both in their design and ideologies. In contrast, candidates today are using visual appearance to distance themselves from the norm, and each other, as much as possible in our unsettled political landscape. Arguably, design and branding of candidates and their campaigns has never been more important. The standard red, white, and blue is no longer enough for many candidates to convey their personality and values, as well as stand out among the plethora of candidates as well as the avalanche of visual media Americans are bombarded with every day. Although people should vote for candidates, not logos, campaign design presents a hopefully memorable short-hand to the candidate’s identity. When people aren’t informed about the candidate’s specific opinions regarding policies or issues, they evaluate candidates by their appearance and aesthetics. The conclusions drawn from design have huge impacts, with the potential to reinforce both positive and negative preconceived notions. Let’s consider the design of the Clinton and Trump campaigns: Trump’s campaign design was rudimentary and, honestly, kind of looked like a spam email (Google image search “Trump campaign emails” if you want a laugh). Trump’s design, while objectively bad, reinforced supporters’ ideas of him as authentic, anti-establishment, and unapologetic while also reinforcing critics’ view of him as unprepared and crude. In contrast, Clinton’s campaign design was thoughtfully and beautifully branded. Its high-end feel supported ideas of her as prepared and accomplished, but simultaneously reinforced negative conceptions of her as too manufactured, cold, and out of touch with everyday people. Clinton’s campaign, while beautifully designed, didn’t serve her well. In contrast, Trump’s bad design served him beautifully. Campaign design is good only if it serves its candidate well, regardless of its aesthetic or how many design principles it follows. 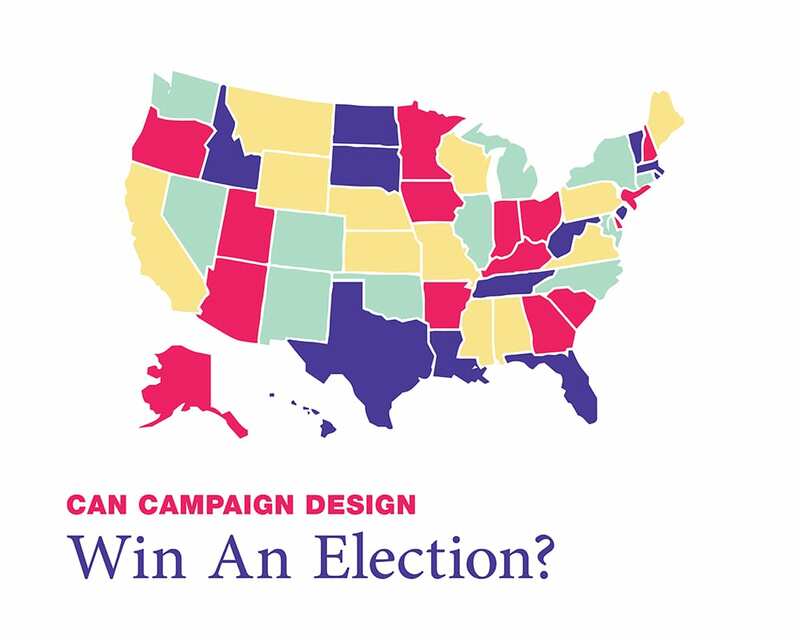 Will design win an election in its own right? Probably not. But it will determine how candidates are represented everywhere, from official campaign emails to yard signs to bumper stickers. And, when people aren’t educated about policies, candidates end up being judged by their appearance. Yes, elections and voting should be based on substance over style, but some people undoubtedly will vote based on a candidate’s overall aesthetic. As the election approaches, it will be interesting to see how the unprecedented campaign designs serve the candidates; hopefully the values represented in their designs don’t stop there.